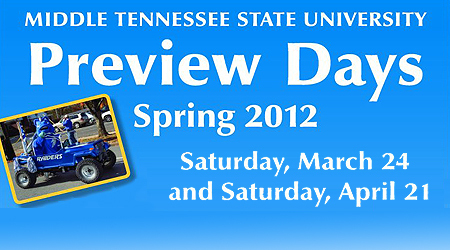 Registration is still open for the final MTSU Spring Preview Day of 2012, which will be held this Saturday, April 21, said Rob Patterson, assistant director of admissions. Participants should preregister by going to www.mtsu.edu/rsvp and selecting “Saturday Preview Day,” then choosing April 21. Patterson added that the preview day is open to interested high-school students, transfer students and their families. Another preview day was held March 24. Spring Preview Days begin with a continental breakfast in the Student Health, Wellness and Recreation Center. Attendees then will be given a campus tour that includes viewing several campus residence halls. Participants also can participate in an academic open house, where representatives from different departments will be available to answer questions. Parking will be available adjacent to the University Honors College and in the Bragg Mass Communication Building parking lots. A printable campus map is available at www.mtsu.edu/parking/. For more information about preview days or the process, call 615-898-5670.